For Mark Gomez, it’s been a really, really, really good year. One minute the 20-year-old is an aspiring, up-and-coming freeride star. The next, he’s riding a vintage stand-up Jet Ski around a pool for Adidas, then flown to the Florida Keys to do his thing in a movie co-produced by Hollywood heavyweights Steven Spielberg and Michael Bay. One amazing story? Trust me…it gets better. If anything could top what has already transpired for Gomez, it’s that he grew up a classic PWC video fan, watching guys like Scott Watkins, Chris Fischetti, Harry Goatcher, and his personal hero, Larry Rippenkroeger, shred on video. It’s been quite a year for Mark Gomez. It’s almost a Hollywood plot of its own that Gomez’s own chance to share that video screen came via Rippenkroeger. Now a successful movie stuntman, the “Ripper” was involved with the search for a professional monkey. Literally. The job was for Kia’s 2010 Super Bowl commercial, a now infamous part that saw the Kia sock monkey tearing up the town on both land and water. “Apparently I met the criteria of a 5′ 2″ guy who could do a barrel roll off a boat wake,” explains Gomez. Though the part eventually went to another talented rider — Chris MacClugage — Gomez had made it onto Rippenkroeger’s radar. And that connection soon paid off. In July, Rippenkroeger pointed another stuntman, Sean Graham, in Gomez’s direction. Graham was looking for a PWC stunt man who could double for popular Hangover actor Ken Jeong, piloting a gold Jet Ski in a small pool. The bit was for an Adidas commercial, starring Jeong and NBA star Derrick Rose. In less than a week, Gomez was officially in the stunt business. 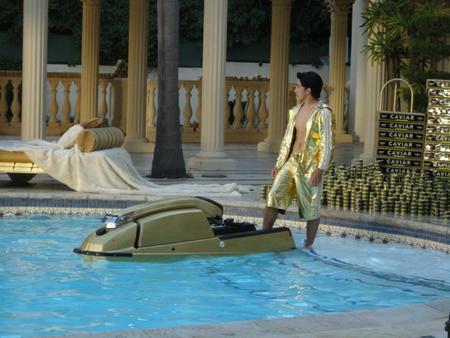 Sporting a gold suit, Gomez is set to ride the gold Jet Ski. “The shoot was interesting,” he recalls. Asked at the last minute to double for Jeong at the top of the star’s “lady pyramid,” he donned a cheap wig and gold Adidas track suit, and soon found himself in bikini heaven. “They had the smoking hot models in gold bikinis stand one row at a time on the platform with a huge blue screen that was put up in front of the house. I was shown a small non-vocal repeating clip of the close up they took of Ken waving him arms that I would have to recreate. Knowing nothing else I was positioned up on the platform and was coached on how to move, then was confused when the director told me to scream ‘Freaky like my lady pyramid!’ I couldn’t have cared less, I screamed that as loud as I could in full character for five minutes over and over again in different movements with the comforting joyous thought ‘I’m getting paid’ in the back of my mind. It’s not everyday you get to play dress up with bikini-clad models. “The Jet Ski scene was cool. I got out of costume and was able to practice in this extremely tiny, three-feet-deep pool. Best part about it was this was super challenging, because my Jet Ski was Clay Cullen’s stock 1992 Kawasaki 550SX, only with a Skat-Trak prop and Westcoast scoop grate. With no quick steer this was a very challenging task. By the time I got going in the pool I would be just one-to-two feet from hitting the wall of the pool and the same thing if I was able to get the ski turned around. They asked if I could do any tricks. I was able to do a tailstand but the director didn’t like how slow it was and liked the last trick I could do on the ski, which was riding fast around the pool with the nose up and dragging a leg so I could actually turn in time. Here’s a look at the set from the pool shoot. While a shot in a high-profile commercial would be a highlight for almost anyone, more good fortune quickly followed. Having earned his Screen Actors Guild card working on the commercial, Gomez was then quickly chosen to work on the new Steven Spielberg/Michael Bay movie I Am Number Four. Directed by DJ Caruso of Disturbia and Eagle Eye fame, the movie is based off a popular book series about a race of alien visitors being killed off one by one. Gomez poses with World Champion Eric Malone. Expected to be a big success thanks to the names attached to it, the movie had Cullen, also a successful PWC racer-turned-Hollywood stuntman, looking to cast two teenage PWC riders for a cool sequence early in the film. Soon, Gomez was flying first-class to Florida, where that portion of the film was being shot in Islamorada. Also brought in to double for the film’s star, and perform a huge PWC backflip, was none other than multi-time World Champion Eric Malone. “Work was tough as we had been flown in a week before the main shoot to practice for the main shots we would have to do,” Gomez recalls. 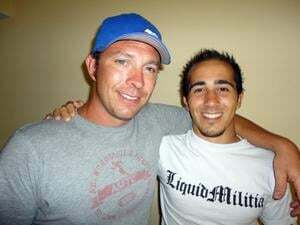 “I taught the other casted teenage rider Cody Johns how to ride a 2010 Kawasaki SXR while I rode a 2010 Yamaha Superjet. As the main crew and actors wrapped up the rest of the movie that week in Pittsburg, we continued to practice our scenes and coordinated riding patters off the coast of Islamorada in bright sunny skies and almost 80-degree water at times. Also known as paradise… without surf. 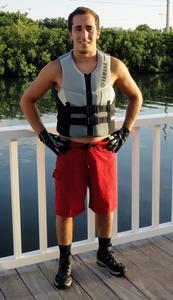 “What was most fun was practicing Eric Malone’s money shot, which was a big backflip off a boat wake. 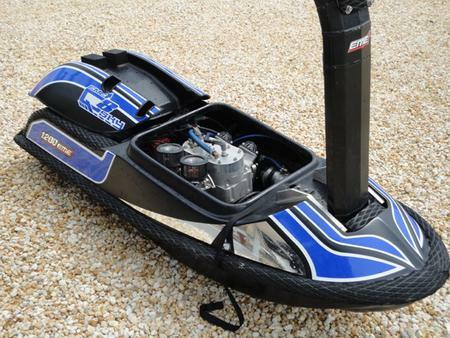 Eric brought both of his new look-alike EME Q8 Sky series hulls, one with his 1100cc motor and another with a toned down 800 motor for the actor and back up. Gomez living the Hollywood lifestyle. Near the end of the scheduled shoot, the moviemakers own bad luck — the helicopter broke down — turned into more good luck for Gomez and Malone. The shoot was extended for one more week. A kid in the proverbial candy store? It only gets better. After telling me he’d like to thank his childhood hero Rippenkroeger for such an incredibly opportunity, as well as Clay Cullen (“he’s a true hard-working professional in the industry and is still down to make the job fun,” says Gomez), the 20-year-old suddenly fanned out for a moment, relating how Scott Watkins brother Mark was also working on the Islamorada-based shoot. Watkins invited Gomez to go out snorkeling during one of the production’s down periods, and suggested they meet up at his house. “I was in the boat looking back at the house,” says Gomez. “Mark Watkins looked at my confused look and smiled while saying, ‘you’re a Jet Dreams fan, right?’ I replied ‘of course, but don’t tell me… is that..?’ He smiled and said, ‘yep, this is the Jet Dreams house where they got ready and launched from.’ If you tie this into how I got the commercial with Larry, this about made my heart explode. It meant everything to me to walk around that house and be standing at a spot I never thought I would. 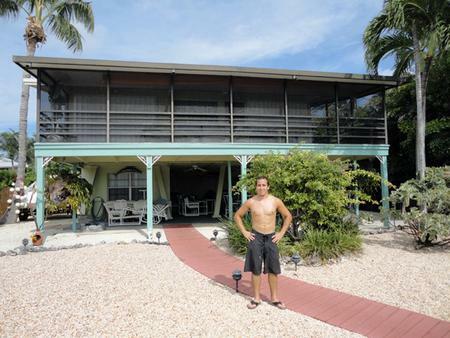 Gomez in front of the Jet Dreams house. “From a little kid in diapers watching a movie, never actually believing I would travel and ride like those guys, to being 20-years-old and standing at that exact spot where my favorite movie was shot, that made my dreams come alive.